Stevens Indicted! No…the other one! Speculation was running rampant about who the next to fall would be in the ongoing corruption investigations by the FBI here in Alaska. The general consensus was that it would be Ben Stevens, son of Alaska Senator Ted Stevens, and former State Senate President. I almost ran off the road when I heard the announcement on CNN. 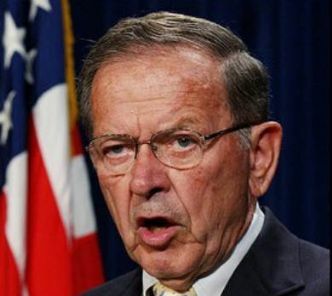 Ted Stevens has been indicted. This is HUGE. The Justice Department will shortly be announcing the 7 count indictment all dealing with statements that were not deemed truthful to investigators. The announcement will come at 1:20pm EST….that’s in just a few minutes. Stay tuned for updates! UPDATE 1: The Anchorage Daily News has posted a pdf copy of the 28-page indictment is available HERE. Stevens was charged with 7 felony counts of making false statements. Stevens apparently didn’t admit on his senate financial disclosure forms to receiving gifts totaling upwards of $250,000 (including a new Land Rover, a Viking barbecue grill, and extensive renovations to his home) from Veco. Tomorrow is the one year anniversary of the raid of his Girdwood residence, referred to in the indictment as ‘the chalet’. UPDATE 2: Just listened to a live press conference held in DC by the Department of Justice. Here’s the gist. He has not been charged with bribery. Bribery requires specific evidence of quid pro quo. A summons will be issued and he will be allowed to turn himself in, and will not be arrested. Where and when this will happen is being negotiated. Stevens was informed when his attorney received a call earlier today. They wouldn’t talk about sentencing or how Stevens’ age might affect that, nor would they discuss a potential plea agreement. I have to admit I was completely gobsmacked by this news. I truly thought that Don Young would far way before the Teflon coated Ted Stevens. I wonder if it is simply a coincidence that the sun came out for about the first time this summer after the news broke. Perhaps we can now look forward to more sunny days ahead for our long suffering state. There’s no one to challenge Begich now. He must be the happiest man in Alaska.